Honour the Egyptian Goddess of Magic at Temple of Iris, featuring generous bonus rounds that triple all wins! Temple of Iris takes you on an adventure back in time to Ancient Egypt. This fantasy slot is a great choice if you like adventurous themes and exciting quality graphics. It has 5 reels with 25 paylines, so there are plenty of different winning combinations. In addition to your classic Kings, Queens, Jacks and Ace, Temple of Iris Slots includes several special themed symbols. The Wild symbol of the Priestess can be substituted in for any other symbol except the Scatter and if you manage to line up five across your reels you’ll win the slot’s jackpot prize. The Scatter symbol is the Golden Pyramid and if you line up at least three on the reels you’ll win at least 15 free spins. Spinning two will win you your original bet back. 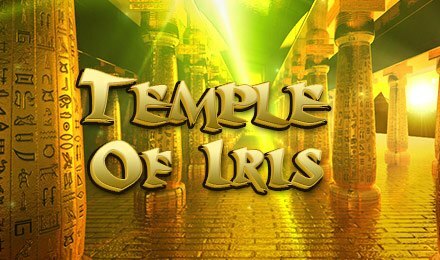 The Temple of Iris game is a fun slot game with a fun bonus feature giving you more chances to win. Spin your way to fortune with the Goddess herself!